Roadschooling America: Where is Barbara Manatee? Wow, it got cold last night! I think we may have approached the 30s so the heater was a little busy keeping us warm, but it did its job well. Unfortunately there were multiple people up during the night and early AM so it was not quite the relaxing sleep in Saturday I was hoping for. It did allow me to get some extra end of year work items in and still have time for family stuff. We decided that today would be our visit to the Homosassa Springs Wildlife State Park. This used to be a private wildlife park/attraction with monkeys, bears, lions and many other animals. The State of Florida took over ownership in the late 80s and decided that they would only have native Florida wildlife in the park. They were able to get rid of all of the animals except Lucifer the Hippopotamus. The people of the area wanted to keep him around and the governor made him a Florida citizen so here he remains. The park has a parking lot about 3/4 of a mile away from the wildlife area so you can take a boat ride from the Visitor Center down a river. This was a good way to get some information about the park while getting to see some Florida wetlands/river habitat. Only bad part was it was cold! 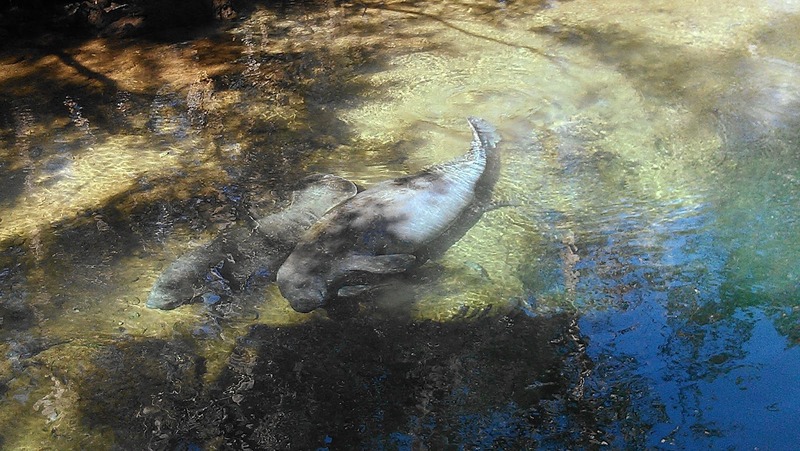 Once at the park we went right to the manatee area and were able to see half a dozen manatees of different sizes. There was even a mom and baby in the main area we were at. It is pretty amazing how big these creatures are but it sounds like they are also very gentle. They do have guides to take you snorkeling with them but not sure we are all up to that yet. The park also had a lot of other wildlife including deer, Lu the Hippo, alligators, black bears, snakes and reptiles, birds, bobcats, wolves and even a crocodile baby. We all had a good time going through and seeing all the animals. Lu is just about to turn 53 in January so he was not quite as energetic while we were there. He seemed to just want to warm up by soaking up the sun. Don't blame him there! We decided we were starving and a local Chinese place got good reviews so we decided to go there. Everyone had a good meal except Ben decided he did not like his. Guess we have some leftovers so not too bad of a thing. We got our propane tank filled which was a little embarrassing as we did not read they only took cash. In the end we were able to scrape up all but 35 cents of what we needed to pay and I guess being in the Christmas spirit the attendant allowed us to waive the remainder. When we got back to the trailer I was able to take a nice long nap which felt great while the kids went and played on the playground. Stacey decided to use the time to do some learning. It is nice to have some quiet time some days. The night finished out with us watching the Santa Clause movie with Tim Allen and then the kids heading to bed.